straight toque with tami,eh? : My Little Colorado Visitor! On Thursday around 11:30 am, Spencer (Terry's son) came by to drop off my granddaughter Isabel. She was to be spending the night with ME! As much as I love her twin brother Milo and would have loved for him to stay as well, I was secretly glad that he chose to go rock climbing with his dad so that Issy and I could spend some one-on-one time together. (We have had a special, unexplained connection since her birth). 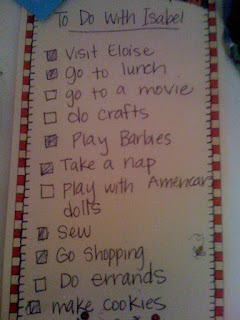 When I knew she was coming, I wrote a list for myself to help me think of things to do with her incase I couldn't think of anything. The list wasn't really for Issy. 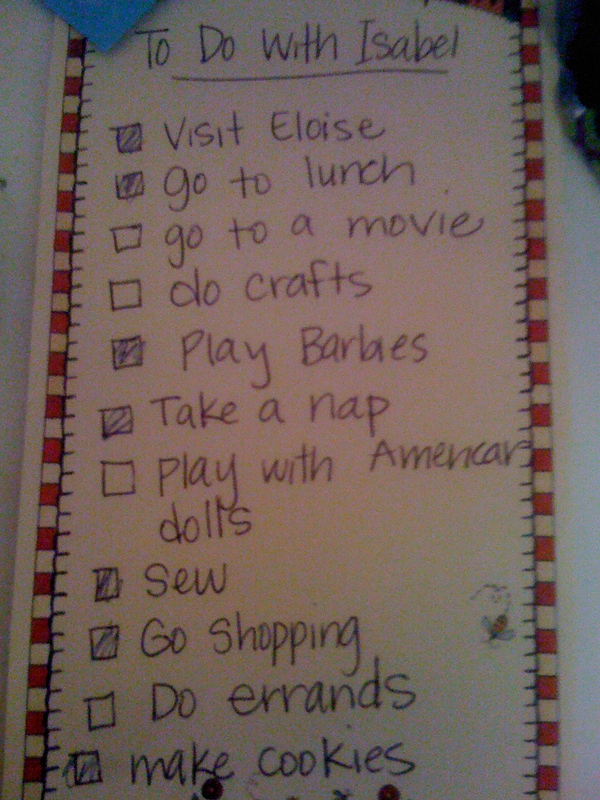 But, she found it immediately and announced "I'll keep this by my bed and check off all the boxes when we do them!" What an awesome day! And, what an amazing little seven year old girl. 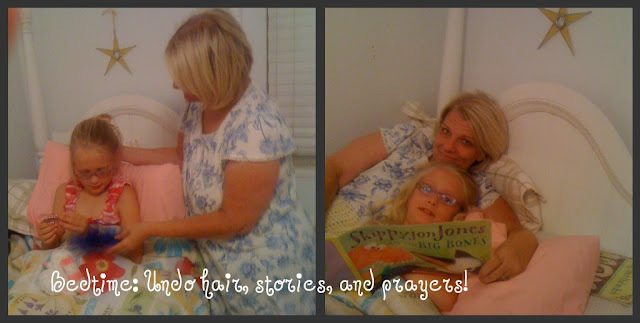 She was so polite, sweet, kind, obedient, honest, true...on and on. It was a joy having her here. Wow! Will you be my grandma? Seriously, you have to be the coolest grandma- EVER! Looks like a great time was had by all. I haven't either Erin!! It was so much fun. She is such a wonderful little girl. I just love her so much. How did Milo like his FBI set?? Has he used his billy club yet? ?